Well, another long weekend in autumn was approaching... and I wanted to keep to my vow: try and get out and enjoy the beautiful autumn colors of the northeast. Too often I've made this promise, only to find that November has suddenly arrived and I've done almost no fall hiking at all. Fortunately, the weather for the Canadian Thanksgiving weekend was shaping up to be especially beautiful. 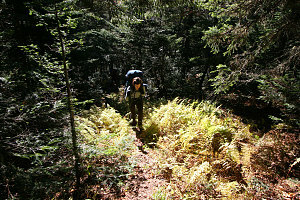 Also fortunately, Ewart was planning to resume hiking after a long summer of endless backyard landscaping. 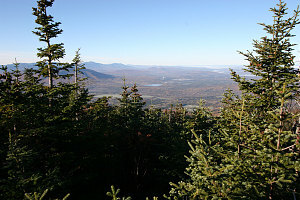 Even more fortunately, he and I had been musing about the same two 4000-footer peaks in New Hampshire: Mounts Waumbeck and Cabot. We both needed these two for our 111er quest. Everything was coming together nicely! 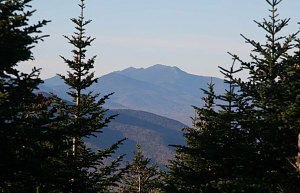 The Pilot and Pliny ranges, where Mounts Waumbeck and Cabot are located, are a range of rounded, wooded peaks not far north of the much higher and more spectacular Presidential Range. Many peaks near 4000 feet in height, but only these two poke their summits above the 4000-foot mark. So, It didn't look like it would be a hike full of amazing picturesque lookouts, but on the other hand it did look like it would be a hike in relative solitude (which I like). 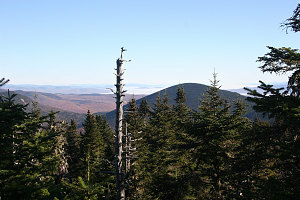 Since we were driving two cars down to New Hampshire, we aimed for a challenging traverse, from south to north, along the main spine of the range. 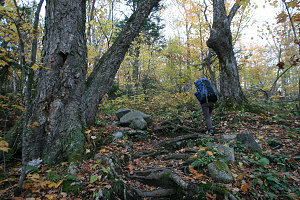 This would involve lots of ups and downs over many other almost-4000-foot peaks. 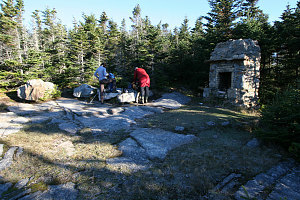 We also aimed to make the trip over two days, staying overnight in the only free mountain hut in the state of New Hampshire, near the summit of Mount Cabot. 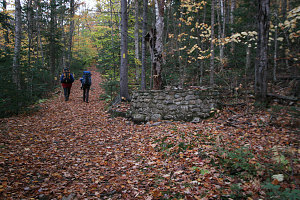 The hut (I'll call it a cabin from now on) is an old Forest Service facility, now maintained by a local boy scouts group. By staying at this hut, we could forego pads, tents, and cooking stuff. 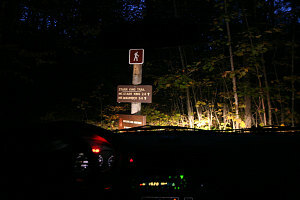 Early Saturday morning, we parked one car at the northern terminus of the Unknown Pond Trail, at the north end of our route, and we then drove around a long, long way to the southern terminus of our route, at the Starr King trailhead just off US2 near Jefferson, NH. Dawn twilight was just starting to make its presence felt. Ewarts eyes bulged noticeably when I told him this first day would be about 23 kilometres and over 6000 feet of elevation gain! Quite a lot for someone coming off of a six month landscaping sabbatical! 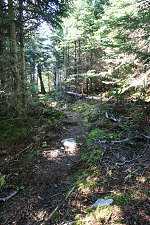 The start of the Starr King trail was benign enough... a leafy walk up a gently sloping old logging road. 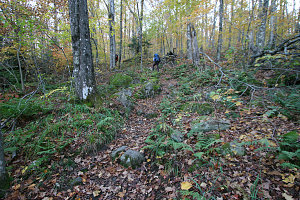 Eventually the trail left the old path and headed up more steeply, over uneven and sometimes rooty ground. 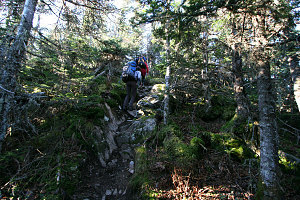 We passed an excellent spring two/thirds of the way up, right at the side of the trail, and coming right out of a nice flat rock face. 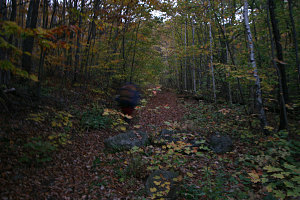 Ewart, for all his warnings about being out of shape, simply charged up the trail. 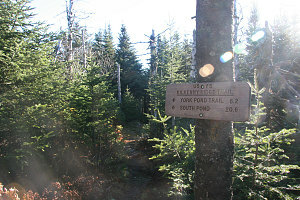 After an hour, we had already gained over 1600 feet of elevation! That's a pretty stiff rate of climb. It wasn't long before we were at the top of Starr King mountain (without any meaningful view), and then the Starr King clearing (where there is a slightly more meaningful but by no means excellent view). 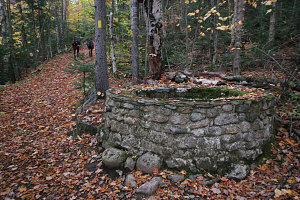 We had a good early morning snack here, examining the remnants (a stone chimney) of an old structure. 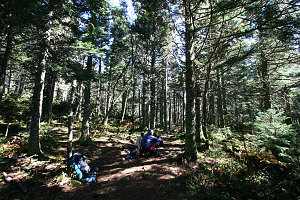 From here, we'd be walking along the crest of the ridge all the way to Mount Cabot, where our cabin awaited us. 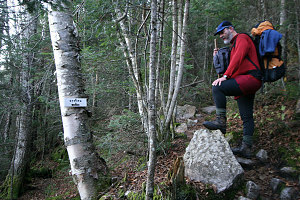 Unfortunately for us, the ridge had many dips and notches in it. Lots of down and up were in our future! 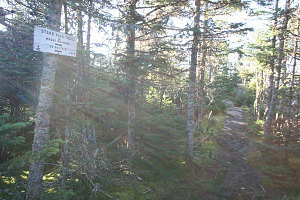 It was a hop, skip and a jump over to Mount Waumbeck, our first 4000-footer. 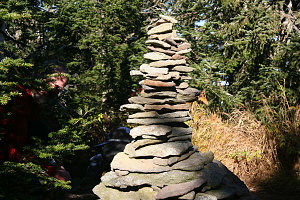 No views on its summit, either, just a fancy cairn and lots of thick, short pine forest. 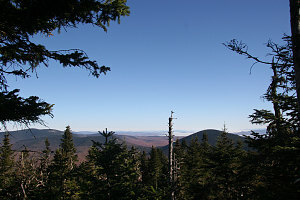 The day, however, was absolutely glorious - totally clear, not a breath of wind, and a perfect hiking temperature. 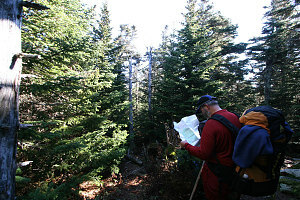 Heading east from Mount Waumbeck, we followed a long, nicely flat section of ridgecrest (a broad forested ridgecrest). In a few spots, we got glimpses north over most of the Pilot and Pliny ranges. We could see many of the ups, downs, ups, and downs that we'd soon be tackling. Lots of legwork ahead! 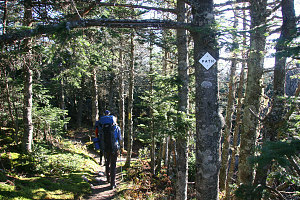 Our route started to turn north as we headed down into the col between Mount Waumbeck's eastern shoulder and the south peak of Mount Weeks. Our mental time was spent figuring out how much down and up we'd gain and lose for the next few peaks on our list. When tackling a long and strenous hike, it's a useful mental trick to just focus on the next few objectvies, lest your mind be overwhelmed! Anyway, in our mind at this point were the three peaks of Mount Weeks.